NASA Worldview is the best starting point for users new to satellite data, and is freely available online. First-time visitors to the site are offered an interactive tour, and the intuitive interface allows for easy navigation. Some air-quality issues can be readily seen: very high concentrations of smoke and dust, for example, appear gray and yellow, respectively. 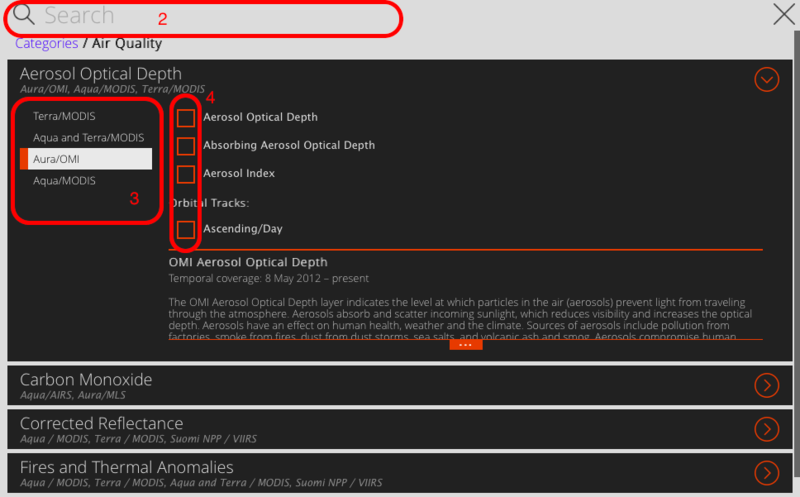 Worldview allows users to add information layers, including AOD and CO, as well as markers relevant to air quality such as fires, thermal anomalies, and dust score. Worldview supports qualitative analysis, but limits data to daily values (there is no averaging function, for example). Choose whether or not to take the Worldview tour (you’ll only be prompted to take the tour the first time you visit the site). 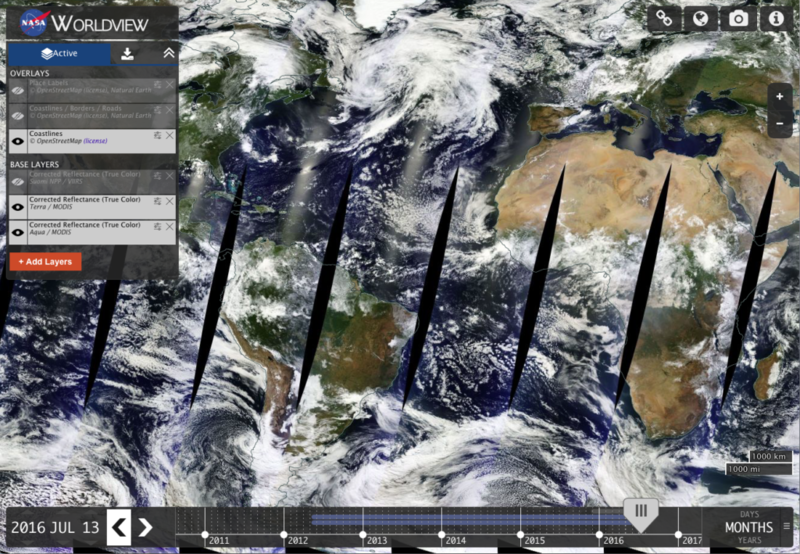 The timeline lets you pinpoint the date for which you want to view satellite data. There are a few different methods that you can use to navigate the timeline. First, click Days, Months, or Years to set the range of the timeline. Click and drag the slider to quickly sweep through and choose a particular date. Click directly on the timeline to jump to a specific date. Click the left or right arrows to move forward or backward day by day. Use the button above and below the year, month, or day to advance the date or return to a previous date. 6. If you’d like to see an animated series of maps for easy comparison, click the animation button. a. Choose how fast the animation should run by adjust the frames-per-seconds slider. b. Move the white arrow on the timeline to set your start date and the blue arrow to set your end date. Then click the play button. c. You can also easily create an animated gif by clicking the gif button. A base layer is the background image of the planet over top of which the satellite data you choose will be superimposed. Click icon to show and hide layers. Drag the base layers to reorder them. 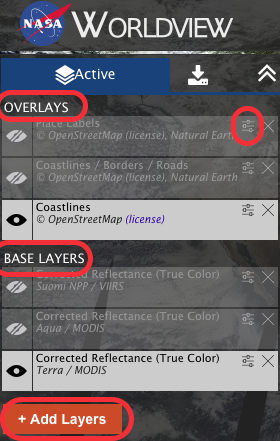 Tip: While you can have multiple layers active, you can only see one at a time. The topmost active layer is the one that you are seeing. When you select an Air Quality overlay (ex: Aerosol Optical Depth) you’ll have the option of choosing which satellites (Terra, Aura, and Aqua) and instruments (MODIS and OMI) you want to gather data from. It’s generally a good idea to choose Aqua and Terra/MODIS. Once you’ve chosen a satellite, select your overlay by clicking the orange box. Return to your view by closing the Add Layers screen. Tip: You can have multiple overlays active at the same time. To change the opacity of an overlay click . To pan the map, drag it with your mouse. Use the icons on the right. To zoom to a specific location, double-click that location on the map. To zoom in on a box, hold down the Shift key and use the mouse to draw a box around the selection you’d like to zoom in on. You can also have the map automatically focus in on an event. Click and select the event you’d like to zoom in on. To create a permanent, shareable link to a particular view, click . To change between Arctic, geographic, and Antarctic views, click . To download an image of your current view, click . To see more information on Worldview and its data sources, click . Select the data product you would like to download by clicking one of the radio buttons. To select data for a particular point, click . Q: Why is part of the screen black? A: Worldview relies on polar-orbiting satellites. A polar-orbiting satellite is one that circles the entire earth, usually in about a day. Because Worldview provides a near-real-time view of what the satellites see, if the satellite has not yet passed over the section of the earth you want to see, Worldview will show a black section of screen. Check back in a few hours. Q: Why is there no data? A: Satellites cannot see through clouds. If there is significant cloud cover (often 30% or more), then the satellite will be unable to return data. Q: Why is there no overlay for NO2? A: At this time (summer, 2016) an overlay for NO2 has simply not been developed. Q: What are those glares on the ocean? A: Those are solar glares caused by reflections from the sun. Q: Why are their slices in the map? A: Because Worldview is projecting the round earth on a flat screen. Q: Why are their slight color differences in the land/water/cloud cover? B: Remember these are near-real-time images and are taken at different moments in time. Colors will change along with the angle of the sun’s rays. Q: How far back does the data go? A: Most data products go back to 2012.